Born in Livorno, Italy in 1875, Leonetto Cappiello, is widely recognized as the “father of modern advertising” for the poster art he created. All great poster artists recognized that success came from a quick passing look. Posters were the advertising medium of choice, and signboards, subways, train stations and just about any flat surface was home to many posters. Competition was great and success was creating that image that drew the viewers eye. It’s still the same today, a boring ad is an ineffective ad. In Cappiello’s day, most poster art was oriented toward colors, women and seductive (for the time) views. It is not difficult to look at the beautiful posters from the Belle Epoque era and come away with two thoughts – a beautiful image, and no idea what the poster was advertising. Cappiello changed all that by making the point of the ad obvious, so obvious that it often was seen in an oversized, exaggerated way. Cappiello also recognized the power of black by using it as the primary, ofter only background color adding more emphasis to the product. The power of any image is in its ability to draw the viewer to the center, through the use of black and of exaggeration Cappiello mastered, if not invented the art form. Biscontine Union is a great example of exageration. No one can view this image without understanding its intent. Even if you don’t speak French, the subject is obvious. The happy, red bearded cossack has always been associated with Russia, like caviar and vodka. 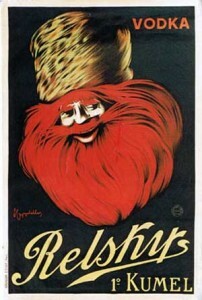 Relsky Vodka wasn’t from Russia, but the smiling cossack is. 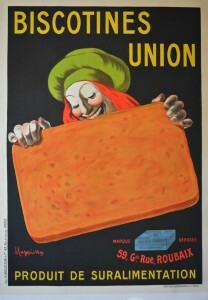 Cappiello produced hundreds of posters over his 40 year career and most are oriented towards product advertising. He ventured elsewhere on a few occasions and while those images are striking, they do not stand out. As was the practice of the day, his posters usually come in two sizes and are highly collectible. Prices vary based on image, size and rarity.